How would you like to produce a research project in three hours complete with a research log, report, documents, family group sheet, and pedigree chart? That is exactly what each Accreditation candidate is asked to do for the final stage of testing. To be honest, this part of the process scared me the most so I was very glad to cover it in depth in my study group. I’ve now completed two practice projects and I’m gaining confidence in my ability to do this. Your abilities in data analysis, research planning, methodology, and report writing will be tested in a three-hour research project. 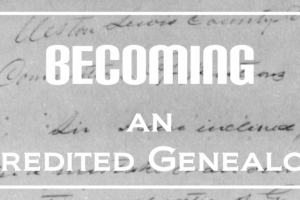 You will be given a practical genealogical problem for which you will conduct research and write a report as if to a client. Your report will detail the results of your research and make recommendations about work that needs to be done in the future. Our study group leaders explained that we will be given a practical pedigree problem and will need to conduct research and write a report as if for a client. The three-hour project is in essence a miniature of the Four Generation Project that I am currently working on. Our assignment for the next study group was to choose a research query from a message board on Ancestry.com and practice the three hour project. Although we needed to generate all of the above elements, we only needed to turn in our report. Our study group leaders counseled us to spend one hour on the research and the rest of the time on the report. Ancestry message board query: I am looking for information regarding my great grandmother Mary “Mollie” Smith (Stewart/Stuart?) who was born in 1866 in and around Pressure Creek, Mississippi. It is my understanding that her father or brothers grew peanuts (could be wrong). Story goes that she left home and got married at age 16, took a boat ride up the Mississippi river and moved to the Chicot, Arkansas area and never saw her family again. She married George Hays who was born in 1852. Any information would be welcomed. Once I chose my research question, I started my timer and went to work. First I needed to formulate an objective and research plan. Research Objective: Locate the parents of Mary “Mollie” Smith (possibly Stewart or Stuart) born in 1866 in and around Pressure Creek, Mississippi. Married about 1882 to George Hays, born in 1852. -Search death information for Mary Hayes in Chicot, Arkansas locality for any clues as to parent information. Find a Grave.com could have an obituary, headstone, or other information with clues to parentage. -Search 1900, 1910, 1920 census records on Ancestry, locality Chicot, Arkansas to find clues as to parents birthplaces. – Search 1870 and 1880 census on Ancestry and FamilySearch, locality Pressure Creek, Mississippi, for possible “Mary” or “Mollies” (Smith, Stuart, or Stewart) born 1866. Mary could be living with her parents as a 4 year old and a 14 year old. -Search local histories in Ancestry’s county history collection in the Pressure Creek, Mississippi locality for further information on early families in the area. Creating my objective and research plan took about fifteen minutes then I started researching. I ran into two roadblocks almost immediately. The locality of “Pressure Creek” did not come up in a Google search so I didn’t have a Mississippi county to research. Then when I located George and Mary Hayse on the 1900 census of Chicot County, Arkansas I discovered that in the race column, the family was noted as “black.” I realized quickly that the parents of Mary were likely enslaved and a completely different strategy would be needed to trace them. With my time constraint I had no choice but to plow ahead. I did as much research as I could, keeping track of my searches and results on my research log. I followed our AG’s advice to write my report as I researched and ended with my conclusion and future research suggestions. Conclusion: According to the 1900 census, Mary Hayse was black and her parents were born in Mississippi. Given the time frame, it is is highly probable that they were enslaved. Much more research will be needed to locate them, starting with a more specific locality of birth. -Oral history is very important in locating enslaved ancestors. All family members should be located and interviewed for more clues on location. – Searching maps and gazetteers for Mississippi in the mid 1800’s could possibly give clues to where “Pressure Creek” was located. Finding this location will be the key to future research. Cyndi’s List> Mississippi> gazetteers is a good starting point. – Once a locality is determined, searching the 1870 and 1880 censuses in that county could be more helpful. -The Freedmen Bureau’s records are being digitized and indexed by FamilySearch. Once a location is determined, a search in that collection could find possible clues to the family. -Marriage records should be searched in Arkansas also, as it is very possible that the marriage took place in that locality. 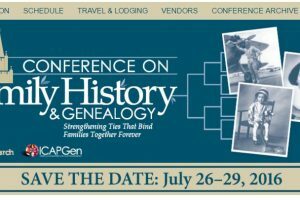 FamilySearch and Ancestry both have good marriage collections for Arkansas. How did I feel at the end of the three hours? Exhausted but hopeful that I could really do this! I completely forgot to attach the one document I found and I needed an extra ten minutes at the end to proofread and make sure I had covered all aspects of the project. I realized the importance of my state research guides in working as quickly as possible. Nice job! The report makes sense and flows well. I did have one question/ comment. Seems to me that the objective would be to document Mary’s birth and identify her parents. May be that is a matter of semantics or I am a bit picky…. If you were able to all this in three hours you won’t have a problem with this part of the test. BTW- The Freedman Bureau Indexing project was just completed. I appreciated this feedback, especially the point that I should have worded my objective a little differently. Forming the correct objective from the pedigree problem is key. Our AG cited a case where a candidate got totally off track and conducted a different line of research than the problem stated. They failed the test and on their next time around wrote the objective out and posted it in front of the computer. I heeded that advice and did the very same thing. How am I going to prepare for this section of the Accreditation testing? Practice, practice, practice! I have scheduled regular three-hour research practice sessions for the next few months. Since the study group, I’ve done another practice session and felt much more confident. Going through the accreditation process has been a boon to my genealogy skills, just as I had hoped. When I’m finished, I’m looking forward to tackling my own end of the line brick walls. Interested in obtaining a credential from ICAPGen? Follow my journey and see if this is for you. Best of luck in your genealogy endeavors! I have thoroughly enjoyed your AG Study Group posts. Thanks for sharing and for taking such great notes. I’m in the study group right now and it’s nice to compare. Thanks, Jana. Hopefully we’ll both be Accredited Genealogists in the near future!